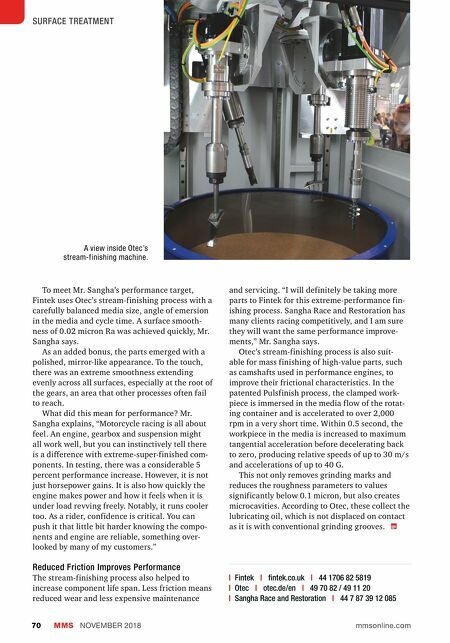 MMS NOVEMBER 2018 70 mmsonline.com SURFACE TREATMENT To meet Mr. Sangha's performance target, Fintek uses Otec's stream-finishing process with a carefully balanced media size, angle of emersion in the media and cycle time. A surface smooth- ness of 0.02 micron Ra was achieved quickly, Mr. Sangha says. As an added bonus, the parts emerged with a polished, mirror-like appearance. To the touch, there was an extreme smoothness extending evenly across all surfaces, especially at the root of the gears, an area that other processes often fail to reach. What did this mean for performance? Mr. Sangha explains, "Motorcycle racing is all about feel. An engine, gearbox and suspension might all work well, but you can instinctively tell there is a difference with extreme-super-finished com- ponents. In testing, there was a considerable 5 percent performance increase. However, it is not just horsepower gains. It is also how quickly the engine makes power and how it feels when it is under load revving freely. Notably, it runs cooler too. As a rider, confidence is critical. You can push it that little bit harder knowing the compo- nents and engine are reliable, something over- looked by many of my customers." Reduced Friction Improves Performance The stream-finishing process also helped to increase component life span. 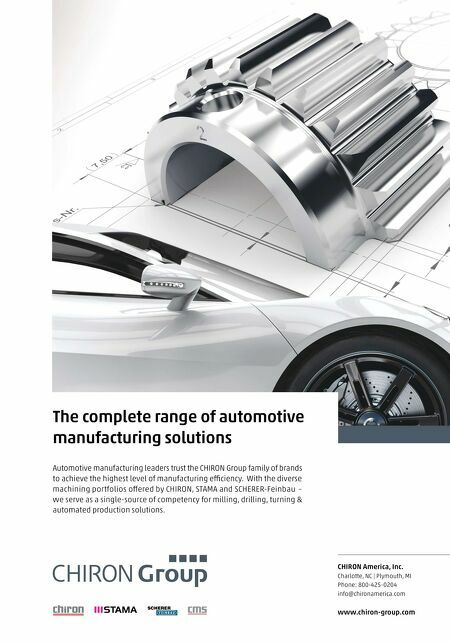 Less friction means reduced wear and less expensive maintenance and servicing. "I will definitely be taking more parts to Fintek for this extreme-performance fin- ishing process. Sangha Race and Restoration has many clients racing competitively, and I am sure they will want the same performance improve- ments," Mr. Sangha says. Otec's stream-finishing process is also suit- able for mass finishing of high-value parts, such as camshafts used in performance engines, to improve their frictional characteristics. In the patented Pulsfinish process, the clamped work- piece is immersed in the media f low of the rotat- ing container and is accelerated to over 2,000 rpm in a very short time. Within 0.5 second, the workpiece in the media is increased to maximum tangential acceleration before decelerating back to zero, producing relative speeds of up to 30 m/s and accelerations of up to 40 G. This not only removes grinding marks and reduces the roughness parameters to values significantly below 0.1 micron, but also creates microcavities. According to Otec, these collect the lubricating oil, which is not displaced on contact as it is with conventional grinding grooves. | Fintek | fintek.co.uk | 44 1706 82 5819 | Otec | otec.de/en | 49 70 82 / 49 11 20 | Sangha Race and Restoration | 44 7 87 39 12 085 A view inside Otec's stream-finishing machine.